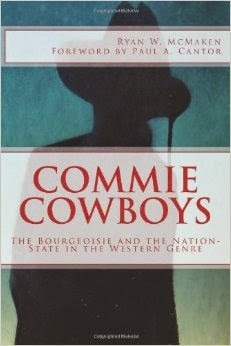 Having become so fabulously wealthy on royalties, I've decided to make my book Commie Cowboys available online for free. I posted it here, where you can download it in PDF. If you like it, be sure to review it at the book's Amazon page. If you prefer a physical book, you can certainly still buy it on Amazon for a measly $5.99. There's an even cheaper Kindle version, also. It's a book that details how the so-called "classic" Westerns of the post-WWII period hardly deserve their reputation for being pro-capitalist symbols of freedom. In fact, the old silent Westerns and the more modern "cynical" Westerns like Unforgiven and The Good, The Bad, and the Ugly are vastly superior, from a laissez faire perspective. Lew Rockwell and I talk about the book here.